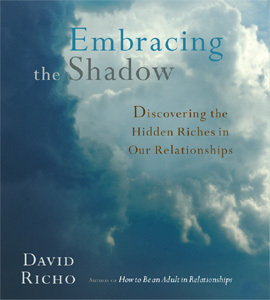 Our “shadow” side comes to the surface in relationships more than anywhere else. The good news is that when we recognize and understand that we can work with our tendency to project our shadow onto those with whom we’re in relationship, we can release ourselves from the habit to hurt or control one another, and we can tame our retaliatory impulses. Using Buddhist-inspired mindfulness techniques and practices for cultivating loving-kindness, David Richo shows us how we can become skilled at noticing our projections onto others and we can learn to withdraw them. We can grow from that process, discovering the wisdom of our shadow side that is hidden even to ourselves. By befriending and embracing the shadow, we can discover the gifts we might not otherwise have dared to recognize or share. This audio recording of a live workshop led by David Richo was recorded at Spirit Rock Meditation Center. The workshop was based on Richo’s book Shadow Dance.